Jovana Pavlovic, a high school student of the Textile and Design School in Leskovac, has won the first prize in the art contest for the 2018 calendar of the development programme European PROGRES, while the second and third prizes went to Viktorija Markovic from the Aleksinac Technical School Prota Stevan Dimitrijevic and Djordje Milenkovic from the Technical School Nikola Tesla in Surdulica, respectively. As he congratulated the winners today in Vranje, Steffen Hudolin, Head of Operations II at the EU Delegation to Serbia, said that this year’s topic of the competition “My Favourite European Project,” although challenging, had encouraged young people from the south of Serbia to learn more about the EU-supported projects implemented in partnership with the Government of Switzerland in their communities and meet projects’ direct beneficiaries. “The participants in the contest have presented not only projects, but also benefits those projects have brought to their communities through improvement of the local economy, infrastructure and access to public services,” said Steffen Hudolin. “Regardless of the project that you had chosen, they all show a tolerant, ecologically clean environment that puts personal and social development at the top of its priorities. The European Union remains committed to supporting you in developing new ideas and the society,” added Steffen Hudolin. 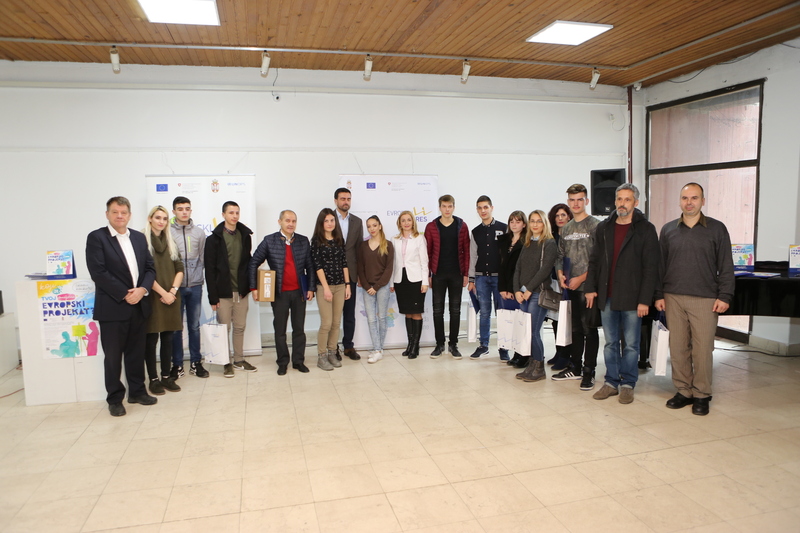 Twelve students whose works are featured in the calendar received prizes – laptop and tablet computers and mobile phones. The Technical School Prota Stevan Dimitrijevic from Aleksinac was declared best in terms of its engagement and commitment during the preparation of entries and visits to projects and was awarded a computer and a projector. The contest also marked the 10th anniversary of cooperation between the EU and the Swiss Government on one, and the United Nations Office for Project Services (UNOPS) on the other side, the course over which more than 560 projects worth EUR32 million have been implemented. “You are a real inspiration to us and I hope that you will continue to inspire your peers, families, teachers and leaders by showing them how small steps can make a big difference,” said Graeme Tyndall European PROGRES Programme Manager and underlined that young people can play a key role in their own development and the development of their communities only through active participation. “The implementation of capital projects creates better living conditions for all our fellow citizens and at the same time promotes European values and best practices. 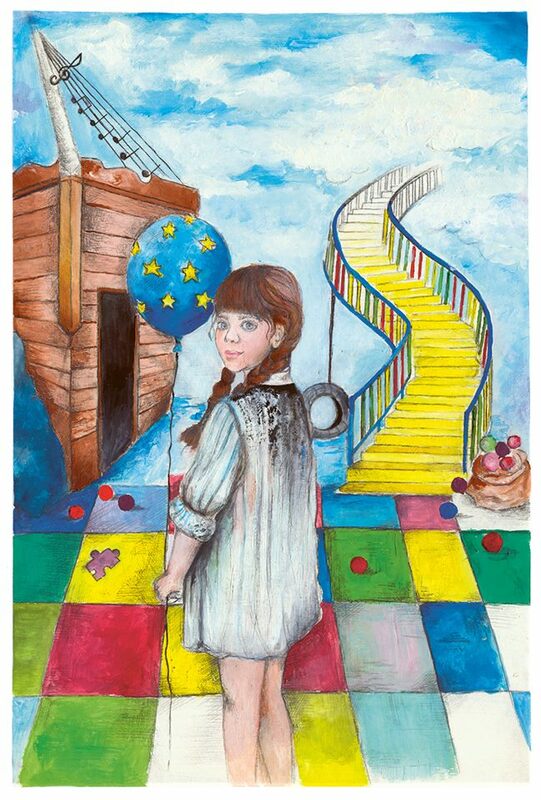 The art contest is actually a combination of education, creativity of young people and European projects in the service of progress of southeast and southwest Serbia”, said Zorica Jovic, a member of the Vranje City Council responsible for culture and education. In addition to the first three award-winning entries, the 2018 European PROGRES calendar features entries from Milan Velickovic from Surdulica, Nejla Causevic from Priboj, Radica Djokic from Leskovac, Milivoje Konstantinovic and Lucija Besevic from Ivanjica, Kerim Avdic from Sjenica, Luka Boskovic from Raska, Stefan Stamenkovic from Vladicin Han and Marta Zivkovic from Bela Palanka. As her favourite project, this year’s winner Jovana Pavlovic chose the improvement of energy efficiency of the Leskovac primary school Trajko Stamenkovic. Head of Operations II of the EU Delegation Steffen Hudolin visited the project ahead of presentation of the calendar in Vranje. Thanks to EU allocation of EUR95,000, the worn-out joinery had been replaced, thermal insulation installed on the roof and facade, whereas new LED panels now give better lighting and improved working conditions in classrooms. The project will cut the budget spending on the facility maintenance. “This project has helped to create better working conditions for over 800 pupils and over 80 teachers and other school staff, and made a significant change for the better in the entire school. 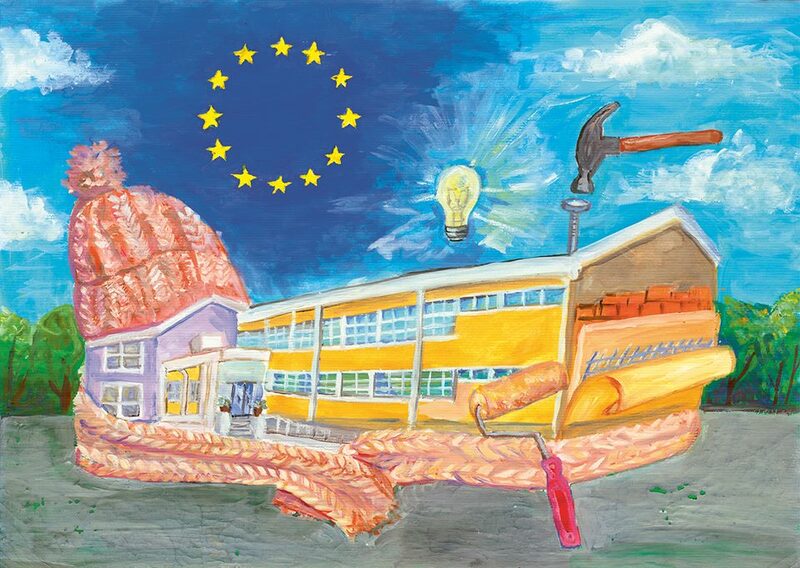 The EU will continue to support the education sector, not only through infrastructure, but also in reform processes on the path toward the EU,” said Hudolin. Deputy Mayor of Leskovac Jasmina Randjelovic pointed out that the local self-government had invested RSD75 million in energy rehabilitation at a number of schools and that Leskovac, the EU and the governments of Switzerland and Serbia have a common goal to provide better working conditions for all students. “Our school has got a completely new look and all of the employees, together with pupils, will do everything we can to make the most of every dinar invested in our school,” said school Principal Suncica Ilic. The European Union and the Government of Switzerland support activities of the European PROGRESS programme which contributes to sustainable development of south and southwest Serbia, with a total of EUR24.46 million. Approved projects will be aimed at strengthening local administrations; creating an environment that fosters development of infrastructure and economy; and improving the implementation of social inclusion and employment policy. The programme is implemented by the United Nations Office for Project Service (UNOPS). The municipalities included in the programme – Novi Pazar, Ivanjica, Nova Varos, Priboj, Prijepolje, Raska, Sjenica and Tutin in southwest Serbia, as well as Prokuplje, Blace, Zitoradja Kursumlija, Leskovac, Bojnik, Vlasotince, Lebane, Medvedja, Crna Trava, Vranje, Bosilegrad, Bujanovac, Vladicin Han, Presevo, Surdulica, Trgoviste, Brus, Aleksinac, Gadzin Han, Doljevac, Merosina, Svrljig, Babusnica, Bela Palanka and Knjazevac in southeast Serbia.